This Supreme Court judgment is the latest voice in an age-old call for reform of the General Marriages (Registration) Ordinance No. 19 of 1907. As a country, we choose to continue subjecting one of the most personal decisions of ending a marriage relationship to the most public adversarial form of adjudication. While two people are technically free to enter into a marriage, they are not free to end it. The law cares very little about your marriage except to ensure that it is recorded. By reducing the barriers to marriage, we signal our encouragement as a society of the marriage relationship. However, the law cares very deeply if you try to end your marriage. Numerous barriers are setup, the most telling one being that the two people cannot end their marriage of their own accord. Instead, the law hands over this decision to a judge. It is not enough that the law removes the right of individuals to decide that they want to end the relationship, the two individuals are also pitted against each other by framing divorce proceedings as an adversarial contest. This unnecessarily complicates a difficult, often traumatic personal and social experience, of deciding to separate. It introduces a legal blame game, reinforces animosity towards each other, and creates winners and losers where there ought to be none. The law requires such a degree of black or white that it is wholly unsuited to the task of determining the end of a relationship between two people. The law tells a judge to look at the facts and the intention and decide whether or not the relationship was abandoned. The fact that the two individuals went to the police station together after an allegedly brutal attack by the husband, and the fact that the wife continued to cook for the husband and he paid for some household expenses, were interpreted as ‘cohabitation’ and that the marriage had not been ‘deserted’. Therefore, the contextual realities and contradictions that play out in marital relationships, do not find a place in the law. In our country we cannot choose to dissolve a marriage by citing irreconcilable differences. We can only seek a divorce by blaming the other person of adultery, impotency or malicious desertion. It is remarkable that those who get married are unaware of the process involved in getting out of the marriage. It has taken people by surprise to realise that, unlike placing a signature and being married, divorce insists on legal papers, a courtroom, a blame game and lawyers’ fees. Today in Sri Lanka, divorce proceedings are conducted in open court. We don’t value the privacy of those going through a divorce, and embarrassment is a tool wielded in this open process. There are instances, where the man will agree to being the one at fault, so that the woman has a ‘clean’ record and her prospects of a future marriage are not in jeopardy. This reaffirms gender stereotypes – of it being okay for men to be adulterers or desert a marriage, while a higher standard of faultless behaviour and a good reputation is expected of women. In an attempt to escape the experience of getting divorced, litigants in the District Courts, some lawyers and judges recognise a practice of ‘uncontested’ divorce. This is where spouses, both with the intent of avoiding the agony to come, agree that one will file the case and the other will not contest it, thereby leaving the judge with little option but to grant the divorce on the basis that basic grounds for divorce are technically satisfied. To ensure that there is no contest, the least objectionable ground of malicious desertion is usually put forward. People are choosing to avoid the long-drawn-out blame game, in what appears to be an attempt to be kinder to themselves, with one party willing to take some blame because the law requires its pound of flesh and bring divorce proceedings to a close as soon as possible. Even this uncontested process, because of the adversarial nature of the court, fosters uncertainty and suspicion. Pitted against each other, even though they may have both agreed to the final outcome, there are a host of fears of ‘what will the other side do or say in court’. Isn’t it time to do away with the fault-based divorce laws of Sri Lanka? To introduce the ground of ‘irretrievable breakdown’ and the broader understanding of relationships that it brings? It could be a process that is presided over by a judge but not in a court room. The role of the judge only to ensure that the legal consequences of the divorce are explained and understood, and legally-binding orders are made where necessary as to property and children. With a system like this, only instance of dispute will relate to property or custody and access to children, and will be subject to arbitration by a judge. These cases too ought to be private matters heard in closed-door proceedings and not in open courts. The usual counter-arguments to a call for reform of divorce laws are: making it easier to divorce, will lead to more divorces; divorces reflect a broken society that has failed to keep the institution of marriage intact. The simple response is that our society has failed to foster meaningful relationships, least of all marriages. Strict divorce procedures adds an element of legal violence on a relationship that has already frayed. It does nothing to help individuals revive their relationship, but fosters fear, hatred, anger and bitterness. If, as a society, we are truly interested in fostering meaningful relationships, dismantling the current legal framework governing divorce is only one small step. Investing in our education system to inculcate strong communication skills, respect and equality between genders, voluntary pre-marital programmes, providing and popularising opportunities for counselling and working on relationships is probably where our attention should be diverted. Instead, we are forcing people within a marriage to stay together without creating any means to help them out of a difficult situation. 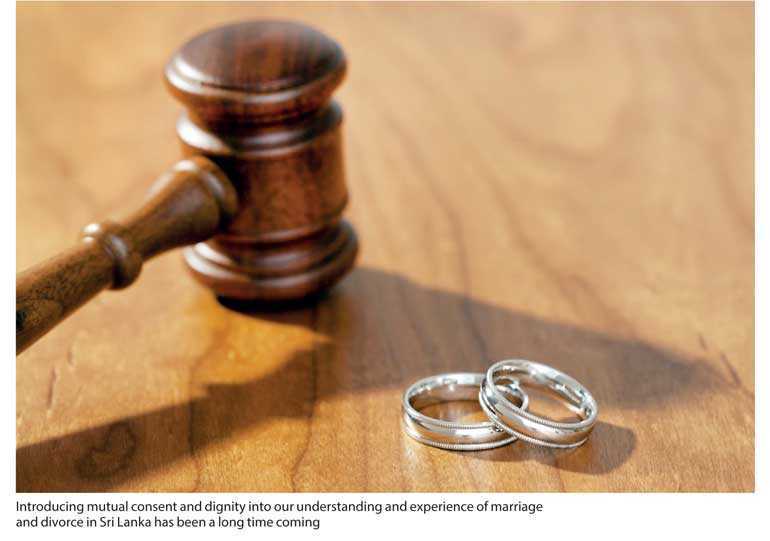 Introducing mutual consent and dignity into our understanding and experience of marriage and divorce in Sri Lanka has been a long time coming. It is more interesting to understand where the resistance lies to this long-standing reform agenda. Is it the political leaders held hostage by conservative, patriarchal or religious views? Is it the legal profession itself? Or is the political and legislative system of this country engaged in anything but meeting the expectations of its people?